To start, I want to express the excellent experience I felt from the beginning of my interactions with Kevin Zwart from Sport Court North. Initially, I was very apprehensive that a court could be placed in my yard that would satisfy my overall size and cost needs. When I made my first outreach, Kevin was very upfront and professional. Kevin arrived for my appointment during a time that fit my schedule. As a high school football coach and individual who works in downtown Minneapolis, Kevin was very willing to meet my needs when it came to meeting and exploring possibilities in my yard. We spent time talking through expectations, realities, and overall potential. I was expecting the typical sales type person that would come out, give a quote and move on to other business. My experience was substantially better. Based on a couple of factors in my yard, Kevin listened to my ideas and then did an even better job of helping me understand how my thoughts might or might not work. His suggestions, detailed explanations (including flags, measurements, and visual placement) and personable passion showed me that he was dedicated to his work. Never once did I feel like I was pressed into a decision. Ultimately, it came down to a smaller sized court that fit into a section of my yard that already seemed a bit crowded. Kevin told me to take a little bit and talk it over with the family – an approach of doing what is right for me. After Kevin’s visit, many additional questions started popping up. My wife and I talked about reconfiguring our backyard; removing a play set, relocating a tree, cutting a tree down and planting a new tree, and moving a fire pit to the opposite side of the yard. Through all of this family conversation, I was emailing Kevin quite frequently. I was asking questions about slope, additional size and cost, thoughts on layout, and piecing the backyard together. He listened intently, provided feedback, and countered or created additional options as I created more space ideas. His replies were incredibly prompt. I never waited, really. It all came to a head as I sat thinking about the actual size I wanted for my kids, including a 3 point line. As I explained what we were thinking about doing to Kevin, he offered to come out and walk through additional options, laying out the court and how it would fit – basically giving me another visual. He and Sport Court North took my budget, my vision, my situation, and my needs all into consideration and made my court happen. Kevin and I sat at my kitchen table and slowly went through the paperwork and order. The whole time, I wasn’t stressed about cost or a ballooning budget. We talked about life; about families and kids, sports and general friendly topics. Kevin didn’t come anywhere close to being a salesman, he was a family friend who wanted the best experience for me and my family. Work started on time, in some pretty intense heat and thunderstorms. The crew was polite, very tidy, and they worked through everything. I would leave for the day and my wife would watch as they made sure things were done professionally. The foundation was cleared, which included working up and down minor hills to get to the back yard. Cement went down simple and clean – zero mess in the yard. The overall timeline blew me away. I thought it would take longer, but when I returned home on the day of completion, the court was pristine. I had requested a specific logo and coloring on my court to match a mentality and logo from the local high school – the same place I coach. It was perfect. I had very minor work to do around the court to bring the grass back – just at the edges. It took my wife and me about 2 hours to lay soil and drop seed all over; super easy and fulfilling. The court was completed in the early part of June 2016. On the 4th of July, we had a neighborhood 2 on 2 tournament between 4 families. It was a riot. 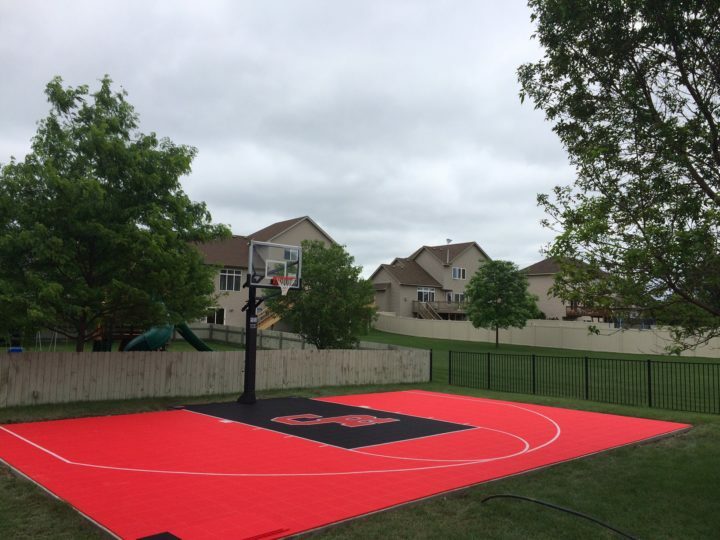 The kids in the neighborhood have used the court to improve for traveling basketball. Recently, we shot some videos on the court for the VP of boys and girls traveling basketball to get drills out to the community and instruct ways to improve over the summer months. My court has been a huge conversation whenever it is seen. Facebook friends have commented, asked questions and inquired. I am patiently waiting for Google Maps to update their satellite shots because I am so darn proud of the court we have! My family has posted pictures of the court on our Facebook accounts and the main page for the company, talking about our experience and how great Sport Court North is. I don’t look at my experience and feel like a customer of Kevin’s and Sport Court North. I look at my experience believing and feeling that Kevin has a great heart, a sound professional approach and a genuine ability to connect with the people he works with. Thank you Kevin for being a great person. You are an asset to your craft.